Large retailers have been accused of trying to water down a proposed scheme to improve rates of bottle recycling. Environmentalists say large and small drinks containers alike should carry a catch-all deposit of more than 15p. But retailers say small “on-the-go” bottles cause most litter, while large bottles are recycled by households and should not be subject to a deposit. Ministers are still considering whether to exempt bigger plastic containers from the plans. The UK proposal, part of the Resources and Waste Strategy, is likely to copy one of the schemes adopted in other countries. In Norway for instance, the shopper pays a deposit on every bottle – the equivalent of 10p to 25p depending on size. The consumer drinks the product, then posts the empty bottle into a machine which produces a coupon to return the deposit. This has led to recycling rates of 97% – whereas in the UK just over half of plastic bottles are recycled. Why do green activists insist big and small bottles are targeted? 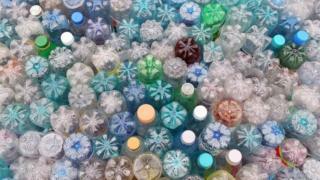 Environmentalists are angry that the industry is still fighting plans to restrict deposits to small bottles. Samantha Harding from the group Campaign to Protect Rural England says the same firms currently attempting to obstruct a deposit scheme managed to kill a similar idea in 1981, when the industry promised to address recycling itself. “But look at the mess we’re in now,” she said. “Consumption has rocketed while recycling has flat-lined. “Our countryside, rivers and oceans are choked with plastic. Meanwhile, Greenpeace said if the government introduced a “half-baked scheme” limited to smaller bottles only, it would confuse customers and fail to stop millions of large containers being burned, dumped or ending up in the oceans. And Libby Peake from the think tank Green Alliance said litter wasn’t the only issue: “Introducing a deposit on all containers would improve the flow of materials into the recycling stream – that’ll be a major plus,” she told the BBC. Andrew Opie, of the British Retail Consortium, said the best approach is to focus on cans and bottles drunk outside the home. A catch-all deposit would mean big bottles going into recycling machines rather than home recycling bins, he argued. This would remove a source of revenue for local councils, because plastic bottles are valuable for recycling. He said: “We all want to see a world with no plastic pollution and high levels of recycling. Ministers have opened formal consultations asking the public and industry which sort of scheme they should support. The consultations will last 12 weeks, and the government will later announce its final policy – decades after deposit return schemes were introduced in other countries. What else is in the waste strategy? The bottle plan is part of a wide-reaching government strategy to change our relationship with waste. One environmentalist WHO? said it was “unbelievably radical” in some respects. Tackle the recycling postcode lottery under which different materials are recyclable in different areas. Introduce consistent labelling on packaging so consumers know what is recyclable. Make firms responsible for the cost of disposing of the things they sell. This might extend to textiles, fishing gear, tyres, construction waste, mattresses, furniture and carpets. Make companies pay higher fees if their products are harder to reuse, repair or recycle. Force councils to offer separate collections for food waste and free garden waste collections. Urge manufacturers to design products that last longer and increase the levels of repair and re-use. Crack down on waste crime by introducing electronic tracking of waste shipments. Haven’t we heard all this before? Ministers say their final proposals will be included in a new Environment Bill before the summer holidays. Some of them are not new, but more details emerge at every stage of the drawn-out process. One very intriguing suggestion appears from the latest papers, for instance. The government thinks a well-managed recycling and resources policy can actually make money, rather than costing it.